Liquid Containing Solid Particles And Long Fiber. 1. Designed with large-flow and anti-clogging hydraulic components to have greatly improved the throughput capacity of sewage, it can handle fiber material with a length up to 5 times of pump diameter and solid particles with a diameter up to 50% of pump diameter. 2. Reasonable design, good matching of motor, high efficiency and remarkable energy conservation. 3. Double-channel mechanical seal in series, made of durable wear and corrosion resisting hard tungsten carbide to enable pump working safely for continuously over 8000 hours. 4. Compact structure, small volume, easy to move and install, no need of pump room, work when submerged into water, great economization of construction cost. 5. Oil and water probe is fitted inside oil chamber. Once the mechanical seal at pump side is damaged and water comes into the oil chamber, the probe will send out signals to carry out protection to the pump. 6. Upon request, it can be fitted with full automatic safety protection control cabinet to carry out monitoring control on the water and electrical leakage, overload and over temperature etc. Thus to ensure reliable and safe operation. 7. Double guide rail auto coupling installation system to bring great easiness to installation and maintenance, so that people are not obliged to get into the sewage pit. 8. Float switch can control the stop and start of pump automatically according to the change of required water level, with no need of a special person to care about it. 9. Service within the range of head to ensure motor not overload. 10. According to service conditions, motor can adopt water jacket type external circulation cooling system to ensure the safe operation of pump under waterless conditions. 11. Two types of installation, fixed auto coupling installation and movable free installation to meet the needs of different service conditions. 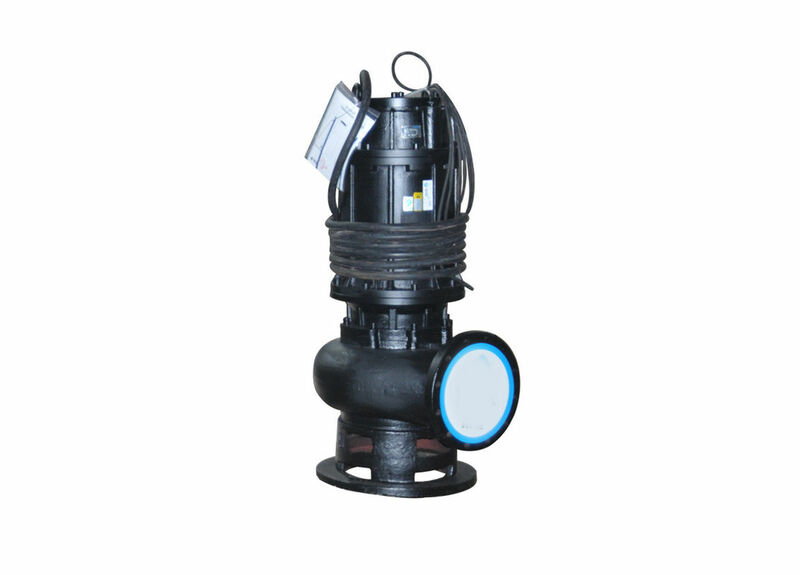 QW(WQ) type Non-Clog Waste Water Centrifugal Submersible Sewage Pump is made up of motor and pump, which are separated through oil isolation room and mechanical seal, it is short in length that motor and pump share the same axle (rotor), the structure is compact. 1. Temperature of medium not over 60℃, gravity 1.0 to 1.3kg/cm3, PH within 5 to 9. 2. For pumps without internal gravity circulation cooling system, the part of motor revealed out of liquid surface should not exceed1/2. 3. Normally, pump must work within the range of its head so that motor won’t be overloaded. If it is to be used in full head, please point out separately when placing an order for our convenience to make the right product for you. 4. In the process of operation, the current of motor shouldn’t exceed its rated value. We also could redesign it for customer's requirement, if you are interested in our products or you have any confusion, please don't hesitate to contact us, you can also refer to our website, we will try our best to benefit you.